Shipbuilders of Sevmash are well aware of aircraft carrier INS Vikramaditya (former aircraft-carrying cruiser Admiral Gorshkov) which is being reconditioned for Indian Navy. That is natural – they have spent much trouble on the carrier to achieve current impressive appearance. Today, she is an enormous ship with displacement of 45 000 tons, as high as a twenty-storey building, and as long as three football grounds. About 2 600 rooms are located inside the ship on 22 levels; they are battle stations, crew quarters, cabins... Hangar size is also impressive – it is 130 meters long. Somewhat 2 000 crewmembers including pilots, technicians and other air wing personnel can serve in this floating city equipped with "airport" and workshops, "residential buildings" and mess-rooms, hospitals and recreational sites. And the time when all that comes true is near at hand. According to general modernization schedule, INS Vikramaditya is supposed to be delivered to Indian customers in December 2012. People who are in charge for this strategic Russian-Indian contract are sure it will be so. ...Speaking a "military-accented" language, floating base Severnaya is a battle staff of the ship retrofitting. All basic decisions are made here; it is the place where director general, his deputy, chief engineer, and deliverer-in-charge hold briefings with engineers, shipwrights, workers... Current and prospect objectives are assigned and summarized here. In a word, that's a real headquarters. Few days ago I had a chance to meet with production director No. 4 (military technical cooperation) Sergei Novoselov, his deputy Georgy Zhukov, and deliverer-in-charge Igor Leonov in floating base Severnaya. The project's top managers wanted to share more than good news with Korabel; an important construction phase – electrification of INS Vikramaditya – had been finished. And take note, it happened one month ahead of time specified in the general schedule! KORABEL: All right, everyone knows that without electricity any equipment is just a lifeless metal heap. So now, when the carrier is electrified, can we say that the ship has come alive? Sergei NOVOSELOV: Sure. It's hard to overestimate this event. Perhaps, its significance can be compared only with a ship's launching. Igor LEONOV: To accomplish this task, we have to do colossal number of works, including electrical safety operations. It is obvious as there are over 1 000 electric boards in the ship; almost two hundreds of them are high-voltage ones. Georgy ZHUKOV: Now all four central switchboards are electrified, so we can begin to start mechanisms which are over 1 500. We're going to "open" the first hundred of them in the nearest days. In other words, the phase of adjustment works starts. Sergei NOVOSELOV: That's right, but the main work started only in the fall of 2007. Before that we had disassembled equipment and cleaned the hull, rooms and everything. And when Nikolai Kalistratov was appointed Director General of Sevmash three years ago, the construction suddenly entered its active phase. The shipyard has gained a considerable momentum since that time. We've done so much throughout these three years... Under auspices of I. Ponomarev, department deputy director of Rosoboronexport and A. Alsufiev, Sevmash's chief engineer, our experts fruitfully participated in Russian-Indian talks on changes in repair and retrofitting costs. As for now, all "i's" have been dotted; Indian partners pay for all works without delays and this makes possible to purchase all needed equipment and materials in time. New organizational structure and general schedule have been approved. All work clusters have been determined; each one is headed by deliverer-in-charge. Number of direct workers has been significantly grown – today, they are almost four thousands including electricians from SPO Arktika. KORABEL: Input of electric power is a significant event. Could you name any other milestones? Igor LEONOV: They're not too many. We have enlarged flight deck sponsons; replaced forebody; extended stern part; assembled propeller rudder system and grounding gears; shaped a ski-ramp for horizontal takeoffs and arrested landings. In the falls of 2008 the carrier left the shipyard's basin; that was a unique operation – there were only few inches between the ship's boards and caisson walls. We finished loading of large-size equipment in 2009. To do that, we made 540 access holes in the hull of Vikramaditya, and then rewelded them. Works on the bulkhead were successfully completed in 2010 – arc welders and riveters of 42nd shed did show their worth. What utmost powers were given to assemble ventilation and air conditioning system meant for tropical climate (high temperature and humidity)! Fans and coolers have been already built in; air ducts are ready in 60 per cent of compartments. Totally, we have done 80 per cent of pipeworks. In January 2010 the ship was ready for electric installation works; as a consequence, 1 890 km of new cables have been laid while only 500 remained. Georgy ZHUKOV: Another complex operation was alignment of four shaftlines. We have finished assembling of turbine-geared propulsion units, turbo-generators, diesels, and eight boilers (each one weights 40 tons and is as high as a 2-storey building). All those works were done in extreme conditions, since the ship was afloat. Engineers from Scientific & Technological Dept helped us and developed special methods, equipment, and accessories. KORABEL: Ships of this kind are often called floating airfields, but aircraft system is a totally new experience for Sevmash shipbuilders, right? Igor LEONOV: Nevertheless, we've already mounted three arresters, two aircraft elevators, takeoff retaining devices for aircraft tests (designed by Corporation MiG especially for INS Vikramaditya), and numerous ammunition holds. Assembling of aircraft fuel, nitrogen, and oxygen storage and supply system is another technically complicated problem in terms of safety; however, it was successfully done as well. Let's go ahead. Electronic warfare systems include over 100 various antennas and 60 battle control stations. On November 30 we completed mounting of 600 electronic warfare devices, and electricians from Arktika have already started to connect them. KORABEL: We've slipped to future prospects of Sevmash. What else has to be done in the nearest time? Georgy ZHUKOV: We're going to finish fire tests by January 15, 2011. This will make possible to wash hull systems by conditioning oils. And then everything will be done step by step: beginning of mooring trials in February-March 2011 which is entirely in accordance with general schedule, and sea trials will start in November 2011 in the White Sea. They will continue in 2012 in the Barents Sea. Air wing will be tested there, as well as operability of 'ship-aircraft' system. 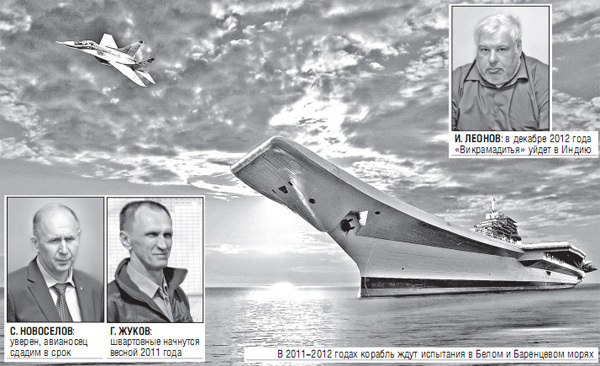 Igor LEONOV: We will conduct dock inspection of the ship's hull in winter 2011-2012 in Murmansk. INS Vikramaditya will head for India in December 2012. Nonetheless, Sevmash will provide a one-year long warranty service after delivery of the carrier and then a 19-year long post-warranty service. Sergei NOVOSELOV: Those guys are really top-sawyers! We've shaped not only working relations but friendly ties with them. Recently they started to take part in work planning – three times a week Indian officers meet with Director General of Sevmash and top managers of the shipyard. On Tuesdays we go around the ship with the head of the observation group and resolve technical issues by the way. So, we're in full contact. KORABEL: When the crew of Vikramaditya arrives in Severodvinsk? Igor LEONOV: Very soon, early in 2011. We expect up to 1 400 officers and enlisted to come at different dates. But they will observe mooring trials first. KORABEL: Let's get back to production. In 2010 the works were conducted under a new so-called weekly planning system. Sergei NOVOSELOV: We must give credit to the president of United Shipbuilding Corporation Roman Trotsenko who recommended to apply weekly planning. That contributed much to acceleration of the production process. Look, about 1 500 operational posts headed by foremen are set every week. Money reward system is closely connected to the weekly planning – you've done the job well, you get a good bonus. Such system has a plenty of advantages. Among them are permanent monitoring over all current works and preparation for subsequent ones, labor movement, financial flow, people's motivation to complete work in time, final-result orientation. Roman Trotsenko set regular interagency meetings at the shipyard with mandatory inspection of the ship. Weekly reports we sent to United Shipbuilding Corporation also pep up. On the initiative of R. Trotsenko and N. Kalistratov, all who work overtime have free meals. Many interagency problems are resolved thanks to United Shipbuilding Corporation, Ministry of Industry and Trade, Rosoboronexport, and Russian Navy. Let's not forget that this Russian-Indian project is permanently controlled by Russian government. KORABEL: If Sevmash is tasked to build a new aircraft carrier, would you manage to? Sergei NOVOSELOV: Indeed, I'm sure of it! Through recent years an effective administrative structure has been shaped in Sevmash. Now the yard is capable to negotiate construction, repair, and modernization contracts for large surface ships – primarily, aircraft carriers – independently. We've established cooperation with hundreds of domestic and foreign factories, institutes, designing organizations, training centers etc. But undoubtedly, the main thing is invaluable experience acquired during the years of work on INS Vikramaditya. It is very important to keep this experience. KORABEL: John Steinbeck, an American writer and Nobel laureate wrote that a ship was something like incarnation of a man's dream. Do your dreams come true? Sergei NOVOSELOV: You see, shipwrights of Sevmash have been always specialized in submarines. And then came Admiral Gorshkov, a giantlike cruiser which was supposed to become an aircraft carrier. That was just what we called a dream, because we had to master new shipbuilding technologies and address large-scale production issues. And I think we do it well. Sevmash have been managing so far. Moreover, as a matter of fact we build a new carrier. So, our dreams come true.